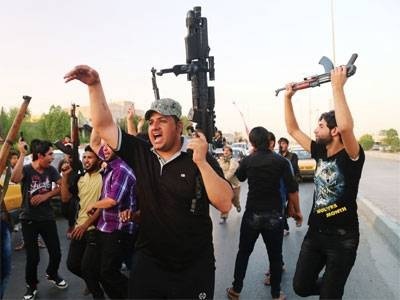 JNN 15 July 2014 BAGHDAD — Iraqi security forces on Monday continued to battle against Terrorist groups across the country, while Islamist insurgents seized areas of a Sunni-dominated province after clashing with local police and residents, security and medical sources said. Terrorists Monday assaulted the final area of the Iraqi town of Dhuluiyah, just 80 kilometers north of Baghdad, after tribesmen rejected an offer to let them enter uncontested as Iraqi forces have killed more than 150 Takfiri militants in recent operations across Iraq. ISIL terrorists negotiated with tribesmen in Al-Jubur, a lone area of the town still holding out, but the tribesmen rejected the offer, and insurgents Monday launched a renewed assault on the area in southern Dhuluiyah, local official Marwan Mitaab said. A resident also said the fighting was ongoing and that Al-Jubur was the last area that has yet to fall, according to AFP. In the largely Sunni Majority Salahudin province, local police and Armed Sunni residents have been trying to rebuff Wahabi Terrorists affiliated with the Islamic State (IS) group, an al-Qaida offshoot, since the early morning hours in the town of Dhuluiyah, a local police source told Xinhua on condition of anonymity. The battles began around dawn on Sunday when IS militants stormed the town, seizing its northern part after blowing up a local government office building, a town court and a bridge. Local police and armed residents prevented the militants from capturing the southern part of the Dhuluiyah, killing at least seven IS militants and wounding more than 10 others, the source said. Four policemen and two armed Sunni civilians were killed in Sunday’s clashes, while three policemen were wounded, the source added. On Monday, the Wahabi Terrorists continued its attacks on the southern part of the town with mortar rounds, damaging several houses. Iraqi army helicopters pounded two posts of the IS militias in the town and struck two of their vehicles, killing and wounding unknown number of militants, the source said. This isn’t the Islamic State’s first attempt at conquering Dhuluiyah. On June 14, IS militants seized the town but encountered fierce resistance from the police and Sunni Residents, who fought the group and regained control over the town. The Terrorist Group, formerly known as the Islamic State in Iraq and the Levant (ISIL) has stunned the world by capturing large swathes of territory both in Syria and Iraq, overrunning the latter’s army and snatching up a large cache of weapons from military depots abandoned by Iraqi troops. Two weeks ago the group declared the creation of an Islamic caliphate in the area, and demanded that Muslims worldwide pledge allegiance to it. Meanwhile, the Iraqi army continues its campaign against the insurgents. Army aircraft shelled a suspected militant’s house in the town of Sieniyah, also in the Salahudin province, leaving eight dead, including five of the suspect’s family members, along with five others wounded, a provincial police source said. Salahudin province is predominately Sunni and its capital Tikrit, about 170 km north of Baghdad, is the hometown of former president Saddam Hussein. This came as Iraqi troops have killed ISIL terrorists in Anbar, Salahuddin, Diyala and Babil provinces on Sunday as part of their operations to clear more areas of the militants. In Anbar, government forces repelled terrorists’ offensive to seize the city of Haditha, which is some 200 kilometers west of Baghdad, and a dam on the nearby Euphrates River. A number of militants as well as soldiers were killed in the fighting. Iraqi troops also clashed with ISIL militants in the city of Tikrit in Salahuddin Province, killing dozens of them and destroying 30 vehicles belonging to them. A cousin of ISIL’s leader Abu Bakr al-Baghdadi and a senior leader in the militant group, was also reportedly among those killed in Diyala. In Babil Province, Iraqi soldiers backed by helicopters and planes continued to clear Jurf al-Sakhar area from Takfiri militants. In Iraq’s eastern province of Diyala, Terrorists , including those who are linked to IS insurgents, captured the Shiite dominated village of Tawakul, after clashing with the security forces and Shiite militias, a provincial police source told Xinhua on the condition of anonymity. More than 150 Shiite families fled their homes seeking refuge in safer areas, while the militants bombed a Shiite mosque , known as Husseiniyah ( Imam Bargah ) , the source said. Separately, clashes erupted in the early hours of Monday between a police patrol and a militant group in Imam Musafir area, leaving three militants dead, the source added. Gunmen attacked the house of a district administrator in the militant-seized city of Saadiyah in northeast of Baquba, killing the official and wounding two of his sons, the source added. Also in Saadiyah, gunmen shot dead a former Baath party member near his house, the source said without giving further details. In Anbar province, sporadic clashes continued near the city of Haditha, and the nearby dam on the Euphrates river, as well as in the provincial capital city of Ramadi and the nearby Fallujah, the source said. Iraqi warplanes have bombed a rally of “suspected insurgents” who gathered in support of IS leader Abu Bakr al-Baghdadi in the city of Rutba, killing 30 people, a provincial police source said. Meanwhile, a civilian was killed and seven others were wounded in artillery and mortar shelling on the militant-seized city of Fallujah, a medical source from the city hospital told Xinhua. In Baghdad, a car bomb went off at a thoroughfare in the Alawi district in downtown Baghdad, leaving at least one civilian dead and nine others wounded. The bomb damaged several nearby shops and cars, an Interior Ministry source told Xinhua on condition of anonymity. In a separate incident, another car bomb exploded in Baiyaa district in the southern part of Baghdad, killing a civilian and wounding five others, the source said. Iraq has been witnessing some of its worst violence in years. About a month ago, Wahabi Terrorists, spearheaded by the IS, launched a surprise offensive that lead to the breakdown of Iraq’s army, as troops fled, abandoning their posts and military equipment. The insurgents have captured a large part of the country’s northern and western territory , which is now being fought by the Iraqi Army and the Iraqi Volunteers to re capture those areas from the Terrorists Groups. This entry was posted in Iraq News, Middle East and tagged Baghdad, Iraq, Iraqi Forces, ISIL, local police, Wahabi Terrorists. Bookmark the permalink. Message: ALHAMDO LILLAH, HOW MANY WAHABI TAKFIRI ISIL TERRORIST SENT TO JAHANNUM , IN HUNDRED OR THOUSANDS , THAT IS IMPORTANT . MAY ALLAH CLEAR THE AREA , THE WHOLE OF IRAQ AND SYRIA FROM THESE CRIMINALS , WHO INSTEAD OF FASTING IN THIS MUBARAK MONTH OF RAMAZAAN HAVE WAGED A WAR AGAINST THEIR OWN FELOW MUSLIMS . THEIR MASTERS IN NAJED ARE ALL SMILES WHILE THE POOR MUSLIMS PALASTINIANS ARE POUNDED DAILY BY THEIR CLOSEST FRIENDS, THE ZIONISTS JEWS OF ISRAEIL . HOW ABOUT A FUHERER ONCE AGAIN ?.